How you throw a party proves your intention and taste truly. While planning for a great party on St. Patrick's Day, make sure that your guests are entertained thoroughly and when they go out of your party, they must have a sweet smile on their faces. Celebrate a bit of the Irish with St. Patrick's Day decorations.How are you celebrating St. Patrick's Day at work? We put together some simple and easy ideas for you to implement in your office. Taking all these into consideration we demonstrate few innovative and creative party ideas for celebrants like you. Check it out and have a blast on that special occasion. St. Patricks Day is an Irish Culture, but it does not always mean that in order celebrate one need to be an Irish. But if you are planning to throw a St. Patrick Day party, here are some brilliant ideas which will enhance your party further. The theme of the party should be filled with Irish flavours though which should tinted with colour of green. If you are planning to host a St. Patrick's Day party at you home, the most important task need to be done is to make a list of your guests who should be invited. 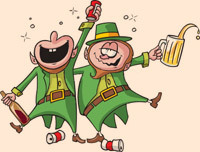 But keep it is recommended to first decide upon whether you want to hold an adult-only party or include kids, for St. Patrick's Day is a festive occasion when drinking beer sometimes become customary. Once you are done with your guest list, customise your own invitation cards. Make sure all of the relevant information is duly included on your invitations such as date, time, location, parking info, etc. You can also mention to your guests whether there any particular dress code or colour code (keep it green). But on a point of advice make sure you send your invitation preferably three to four week prior to the actual date of party. The next issue that should be taken a good care of is how to decorate your house or the venue of party, so that can the venue can showcase a more appealing view to the fellow guests. Decorations for the party wouldn't be complete without hanging cut outs of shamrocks, rainbows, and leprechaun. However here are some of the St. Patrick's Day decoration ideas which you can easily apply. You can adorn your place with beautiful green light bulbs, green helium balloons and shamrock-shaped party lights. Moreover to add on the mood further you further incorporate golden coloured bar made of plastic. Further you can use shamrock tissue garland for hanging. You can also place a big rock at the entrance and make it the Blarney stone. Let people and guests come in and kiss it. According to the legend, if someone kisses on the actual stone, then he is offered a gift of eloquence and persuasiveness. Moreover you can also place a Patrick's day themed door cover for greeting the guests, and enough twinkling green coloured lights so as to cover every nook and corner of your party. And who wouldn't want a gigantic mug of beer on their wall? Apart from decorating the walls and corners of your place, the usage of appropriate cutlery and props are highly expectable. You can bejewel your dining table with some light decorations. Great snacks would be apt for the occasion. Bowls and vases, full of snacks and gold-foil-wrapped chocolate coins, would add spice to your party mood for sure. Make some space for the lucky charms cereal. Go green during the Irish-themed party on the St. Patrick's Day. Definitely the decoration depends on the power of your pocket. It's, however, not a matter whether you are able to spend a hefty amount or you have low budget. Be on your budget and refresh your mood with green streamers. Green light bulbs, green helium balloons and shamrock-shaped party lights would adorn your home entirely. The party wouldn't be complete without wearing the appropriate costumes for the party. And it is quite obvious the color of your as well as your guest's attires should be green. Here are few tips how you can dress up for the party and be the perfect St. Patrick's Day perfect host. Leprechaun Look: St. Patrick's Day is all about celebrating the luck of the Irish, so dressing up like a leprechaun is the perfect St. Patrick's Day costume! To create this costume first you need to find the iconic leprechaun green hat for yourself. For the rest of the outfit, all you will need is a green suit coat, white or green shirt, a green bow tie, white socks, and green bridges (or green baseball pants), and finally black or brown shoes. And to complete the look, wear a fake beard. And for the ladies look on this classic St. Patrick's Day, you can wear a green skirt instead of pants, substitute the white button down for a white tee shirt, wear high black heels, and eliminate the beard. Shamrock Look: the Shamrock costume will be great for all ages. To attain this look, you will need to buy two pieces of large green cardboard, or spray plain green paint on a cardboard. Next, trace an outline of a shamrock (to fit on the person) on the piece of cardboard and cut it out. Next, you will need a long sleeve green tee shirt and green pants. To complete the outfit, use string or yarn to attach each shamrock together at the top, leaving enough space for it to rest on the shoulders. Accessorize this look further with shamrock rings, earrings, bracelets and even face paint! Vibrant celebration of the party of the St. Patrick's Day continues with your favorite drinks. Glasses full of luscious drinks are offered by everyone, starting from the pubs to the local Irish Haunts. Fresh air between drinks would truly be refreshing. Classics like "Danny Boy" would set the mood of the party. Encourage your guests to croon along the melodious tunes. It's not a bad idea to get print outs of the lyrics of the Irish songs. This would definitely help the guests to take pleasure in the music. Make it a point to encourage your guests to showcase their talents. A paper and pen should be given to each of your guest. Ask them to write their heart out. Ideas of writing a limerick and reading them in a stylish Irish accent can be considered as well. Are you looking for an adventure this year? If the answer is yes, then you can ask your guests to go on a treasure hunt. Set a target for them. Just before getting to the desired target, hide the treasure (It could a bowl full of gold-foil wrapped chocolate coins). Let them search for it throughout the party and have fun together. But, make sure that nobody takes an offense at it. The best way to show warmth and gratitude to your near and dear ones is to receive them with small gifts of favor. Different types of favors can be Irish Classic Gift Basket, Shamrock Basket, "I'm Lucky to Have You" Rolo Baskets, Mason jar with Goodies and many more. These gifts are easy to find, for you will get it from any thrift shops. However it is highly advisable to hand out party favors according to the theme of your party. See your loved ones smile from ear to ear when they receive your unique St. Patrick's Day party favors. A St. Patrick's Day celebration is all about the food! Start with salad and Irish soda bread. On top of your salads, make a four-leaf clover shape out of green peppers. Then, serve up the traditional lip smacking Irish foods, such as corned beef, cabbage, Irish Soda bread and innumerable potatoes, as the main meal. Irish Beef Stew should not be left out from the course of the menu. For yummy dessert, use some shamrock-shaped cookies as toppings over an Irish cream cake. Irish whiskey and dark Irish beer should not be given a miss. There may be many among your guests who are not very fond of beer and whiskey, here are few lists of drinks which you can serve to such guest. Green Smoothie: Since green is the color of the day, it's a great to quench your guest's thirst with the Green Smoothie. A typical "green smoothie" consists of spinach, frozen fruit, and juice. You can customize them further according to the taste of your guest. They are easy to make, healthy to drink, and a perfect color for St. Patrick's Day. Irish Mojito: This drink will be highly enjoyed by your guests. This drink also is a perfect combination for mood of St. Patrick's Day. Irish Car Bomb: This is yet another favorite drink in the bars during St. Patrick's Day. You pour a little bit of Irish cream into a shot glass and then top it off with an Irish whiskey. Irish Coffee: It's chilly out in many parts so Irish Coffee wouldn't be a bad choice. Combine hot coffee and Irish whiskey. Add sugar to it and stir well. Add liquid cream to the top of the drink and you can serve this delicious drink that will warm your guest from the inside out. 1. Invigorate the Irish spirit in you by going green in the St. Patrick's Day party. It is a must watch video to know how you can celebrate St. Patrick's Day and throw a party actually staying on a budget.